Besides having all the functionalities of the Centor Easy, the Centor Touch Star TM torque gauge provides handy further possibilities: the graphic display shows the full graph Torque = C(t). This gives you a general overview of the current test. Mounted with a non removable external mini torque sensor, it allows you to measure very small torque with the high accuracy required. The torque gauge is able to make several types of calculations on demand (break point, first peak, average, torque at time T, etc.). It is equipped with a special sensor recognition system. This means that a single instrument can read different sensors (several capacities, Force or Torque). Furthermore, it is possible to freeze its configuration to avoid handling errors. 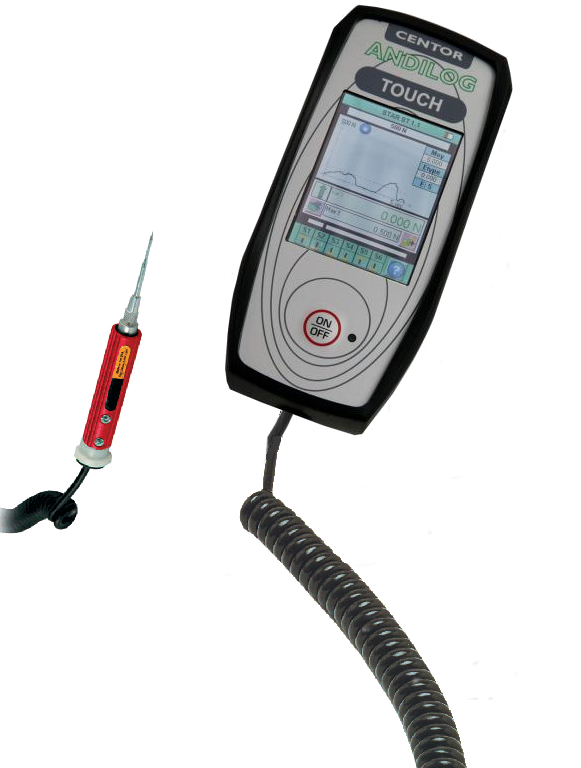 It is the most versatile instrument designed for all tests in industrial surroundings. In real time a live graphing of the applied torque shown on the display and all the measurements made can be store in the internal memory, which has a capacity of 2000 values. The memory can then be easily transferred to a USB stick with the optional DATASTICK, or transferred to a computer via USB interface and the CALIGRAPH software. Ideal to check bolt, this torque wrench sensor exist in different capacities to cover all the applications on the market.